Click HERE for my PODCAST on this entry. In the previous entry, I discussed about the different aspects of this blog. With this entry I would like to address the 'quality control' issue. This is the part that examines past picks, where I look back about a year and see how picks from that trailing week period have performed. As I also point out elsewhere, this performance evaluation assumes a buy and hold strategy, something I don't actually do in real life. I sell my losers quickly and sell my gainers slowly piecemeal. This difference would certainly affect performance. On September 29, 2004, I posted Perot Systems (PER) on Stock Picks Bob's Advice, when it was trading at $16.14. PER closed at $14.17 on 12/2/05, for a loss of $(1.97) or (12.2)% since posting. On November 1, 2005, Perot Systems announced 3rd quarter 2005 results. Revenue climbed 12% to $510.1 million from $454.3 million the prior year same period. However, quarterly income dropped to $25.4 million or $.21/share, from $26.6 million or $.22/share the prior year. On September 30, 2004, I posted Sauer Danfoss (SHS) on Stock Picks Bob's Advice when it was trading at $17.08. SHS closed at $18.67 on 12/2/05, for a gain of $1.59 or 9.3% since posting. On November 1, 2005, SHS announced 3rd quarter 2005 results. Sales for the quarter grew 5% to $342 million from $324.7 million the prior year same period. Net income, however, declined to $4.3 million or $.09/share, down from $7.7 million or $.16/share the prior year same period. So how did we do with these two stocks? Well, PER had a (12.2)% loss since posting, and SHS had a 9.3% gain. Thus the performance averaged to a loss of (1.45)% since posting. Nothing to write home about! Thanks again for stopping by and visiting! If you have any questions or comments, please feel free to email me at bobsadviceforstocks@lycos.com or just leave them right on the blog. Hello Friends! Thanks so much for stopping by and visiting my blog, Stock Picks Bob's Advice. Please remember that I am an amateur investor, so please remember to consult with your professional investment advisors prior to making any investment decisions based on information on this website! I am pleased to let you know that I have authored another podcast on the latest entry. Click HERE for the ***PODCAST***. Please come by and visit my Stock Picks Bob's Advice PODOMASTIC website where you can listen to my other podcasts! If you have any comments or questions, please feel free to email me at bobsadviceforstocks@lycos.com. Hello Friends! Thanks so much for stopping by and visiting my blog, Stock Picks Bob's Advice. As always, please remember that I am an amateur investor, so please remember to consult with your professiional investment advisors prior to making any investment decisions based on information on this website. If you are a regular reader here, you will know that I try to do several different things with Stock Picks. I have been writing up different stocks that I think are attractive and deserve consideration, I have been reviewing those picks, and I have also been sharing with you my own trading action and holdings to allow you to have a sort of "virtual reality" of stock market investment decisions from the perspective of an amateur investor. This weekly entry on "portfolio analysis" is a discussion of the actual holdings in my "trading account" done alphabetically. Last week I discussed Progress Software on Stock Picks Bob's Advice. Going alphabetically, today I shall take a look at my strongest holding in my portfolio, Quality Systems (QSII). I currently own 44 shares of Quality Systems (QSII) which closed December 2, 2005, at $84.08/share. These shares have a cost basis (cost adjusted for stock splits and commissions) of only $15.50. Thus, I have an unrealized gain of $68.58 or 442.5% since these shares were purchased 7/28/03. As per my former trading system (I am now planning to sell only 1/6 of remaining positions), I sold 1/4 positions of my original 300 shares multiple times. In fact, I have sold shares nine times (! ), with proceeds totalling $17,718.97, and I still have 44 shares remaining. (My original QSII position was for 300 shares purchased at $30.95 (not adjusted for stock splits), with a total cost of $(9,298.70)) Unfortunately, with my 1/4 sale rate, the position has been dwindling; thus, I have readjusted my sales to 1/6 positions, and I believe the bulk of the positions will remain intact. When will I be selling next? Well with nine sales, that means I have sold portions at 30%, 60%, 90%, 120%, 180%, 240%, 300%, 360%, and 450%. Thus, my next sale would either be on the upside at a 540% gain (6.4 x $15.50 = $113.50) or on the downside, at a 225% gain (1/2 of the top gain sale of 450%) or 3.25 x $15.50 = $50.38. Quality Systems (QSII) has been an early selection for this stock blog, having been discussed on Stock Picks Bob's Advice on 7/28/03. Shortly after writing up QSII, I was sold on the prospects, and made my purchase. I discussed the purchase of QSII on Stock Picks Bob's Advice on 7/28/03. I have, and I continue to strive to achieve trading transparency in my own stock holdings and trades! Let's take another look at this stock and this company. Quality Systems, Inc. and its wholly owned subsidiary, NextGen Healthcare Information Systems, engage in the development and marketing of healthcare information systems that automate medical and dental group practices, community health centers, physician hospital organizations, management service organizations, and dental schools. Its software systems include general patient information, appointment scheduling, billing, insurance claims submission and processing, managed care plan implementation and referral management, treatment outcome studies, treatment planning, drug formularies, electronic patient records, dental charting, and letter generation. Let's take a look at the latest quarterly result for QSII. On November 3, 2005, QSII reported 2nd quarter 2006 results. Revenues came in at $29.5 million, up 39% from $21.2 million reported during the same quarter last year. Net income was reported at $5.8 million, a 56% increase over net income of $3.7 reported the previous year same period. Fully diluted eps also climbed 54% to $.43/share, up from $.28/share the previous year. These were certainly solid results. Piper Jaffray analyst Sean W. Wieland downgraded the company to "Market Perform" from "Outperform," and said in a client note that subsidiary Nextgen will "have to work harder to maintain its historic growth rate." The analyst also saw growing competitive pressure from Allscripts Healthcare Solutions, a provider of clinical software for doctors. Over the past two years, the analyst wrote, Quality Systems saw its year-to-year earnings grow an average of 51 percent. This, he added, may be tough to maintain, and deceleration over the next two years to a 30 percent level is likely. To maintain growth, the analyst wrote, the company would have to "aggressively grow" its sales force, which now stands at 38 people. The stock, he added, "has already priced in much of the anticipated growth in the next 12 months, with no room for error." It is always important to take analysts assessments into consideration. But it doesn't sound like it would be too hard to grow a sales force that stands at only 38 people. But this information needs to always be considered when evaluating a stock! Let's take a look at the Morningstar evaluation for a 'long-term' perspective. Looking at the Morningstar.com "5-Yr Restated" financials on QSII, we can see the perfect progression of revenue from $39.3 million in 2001 to $104.6 million in the trailing twelve months (TTM). Earnings per share have also grown perfectly from $.29/share in 2001 to $1.48/share in the TTM. Free cash flow has been positive and steadily growing with $12 million in 2003, $16 million in 2004, $20 million in 2005, and $24 million in the TTM. The balance sheet as reported by Morningstar is also gorgeous with $63.1 million in cash alone, enough to pay off 1 1/2 times the combined $40.7 million in current liabilities and the $3.2 million in long-term liabilities combined. In addition, Morningstar reports $45.2 million in other current assets. What about valuation? Looking at Yahoo "Key Statistics" on Quality Systems, we can see that this is a mid cap stock with a market capitalization of $1.11 billion. The trailing p/e is 56.62 (it was only in the mid 20's when I purchased shares) and the forward p/e is still a rich 39.11. However, with the steady and rapid growth anticipated, the PEG comes in at 1.39, just a bit over 1.0, my "perfect" growth valuation. Insofar as the Price/Sales ratio is concerned, looking at the Fidelity eResearch website, we find that Fidelity assigns Quality Systems to the "Healthcare Info Svcs" Industrial Group. Within this group, QSII is priced richly relative to the other companies similarly assigned. Topping this list is Merge (MRGE) with a Price/Sales of 13.6, followed by Quality Systems (QSII) at 10.9, further down is Cerner (CERN) at 3.6, ECLIPSYS (ECLP) at 2.6, IDX Systems (IDXC) at 2.4, and Emdeon (HLTH) at 2.3. Thus, by this parameter, QSII is also priced richly. Going back to Yahoo for some additional statistics, we find that there are only 13.20 million shares outstanding. Of these, as of 11/10/05, there were 1.17 million shares out short representing 14.30% of the float or 5.5 trading days of volume. Clearly, the short-sellers are not convinced that this stock can continue its meteoric rise, however, in the meantime, these sellers may need to scramble if QSII continues to pump out positive reports and their bet starts costing them dearly. In my view, anything over a 3 day short ratio should be considered bulllish, assuming no apparent bad news that has been recently reported. The stock does not pay a regular dividend and the last stock split was a 2:1 on March 28, 2005. You can see the virtually uninterrupted ascent of this stock from August, 2003, (about the time I purchased shares!) to its current level. This is a phenomenal chart of incredible strength! What can I say, I own the stock and I love it! So what do I think? Except for the valuation issues, this stock is terrific. This stock is no longer undiscovered, and you do need to pay top dollar to buy shares. Would I buy shares at this price? Well, if it made the top percentage gainers list, I wouldn't hesitate if I had a buy signal from my own portfolio. Meanwhile, I shall sit back and try to sell of the small position I have remaining at a slower rate. Thanks so much for stopping by! If you have any comments or questions, please email me at bobsadviceforstocks@lycos.com, and you can find my podcast on iTunes. Just search under "Podcasts" for "Stock Picks" and I should pop right up! A Reader Writes: "I would like to get your opinion on AEOS"
I've learned a few things (eg. morningstar and fidelity web features). current -13.55% loss (not including today). Thanks Vooch for writing! I appreciate your interest in my blog and my podcast. I am glad you picked up a few ideas from my blog, and hope they are useful for you. I've heard about your buy points (the sell 1/6th at 30, 60, 90, 120,...), but could you elaborate on your sell points? First of all, unless you wrote something you didn't intend, I believe you have misunderstood my strategy. These appreciation points: 30, 60, 90, 120, 180, 240, 300, 360, 450, 540...., are sell points and not buy points! That is these are points where I sell portions of my holdings on what I call "good" news, that is on an appreciation of the underlying holdings. For instance, if I purchase a stock at $10, I will sell ALL of my shares if the stock drops 8%, that is down to $9.20. On the other hand, I will also start selling a stock as it appreciates. Currently, I am planning on selling 1/6 positions on gains of 30%, 60%, etc. In the case of this particular example, I would be selling 1/6 of my holdings if the stock hit the first 'appreciation point' representing a 30% gain or $13/share. This is not in any way a point at which I am buying shares. I am selling some of my holdings! I must of course point out with this discussion, that my approach is not necessarily the best way, the only way, or even always a profitable approach to investing. It is just the way that I am doing things currently! 1) If I have not sold any shares of this holding at a gain, then I shall sell ALL of the holding at an 8% decline from the purchase price. 2) If I have sold a portion of my holdings ONCE at a gain, that is I sold either 1/4 or 1/6 of my holding generally at the 30% appreciation point, then I will only allow a stock to fall back to the "break-even" stock price. Any lower and I plan on selling all of my remaining shares in that company. 3) If I have sold a portion of a stock more than once, then I will allow the stock to fall back to 50% of the highest appreciation sale point. That is if I sold 1/6 of my shares for the third time at the 90% gain level, I would plan on selling ALL of my remaining shares if the stock retraced back to a 45% appreciation level. declines, I sell the whole thing. Finally about American Eagle (AEOS). You commented on how you just purchased the stock and it has declined 6/7 days. Leaving you with a (13.55)% loss. In my portfolio, I would probably consider buying a stock like AEOS. I will review it in a second. But I wouldn't stay sitting on a (13.55)% loss. As soon as a stock hits an 8% loss, I sell the holding. I don't care if I have held the stock for one week or one year. The stock goes down, then out it goes. 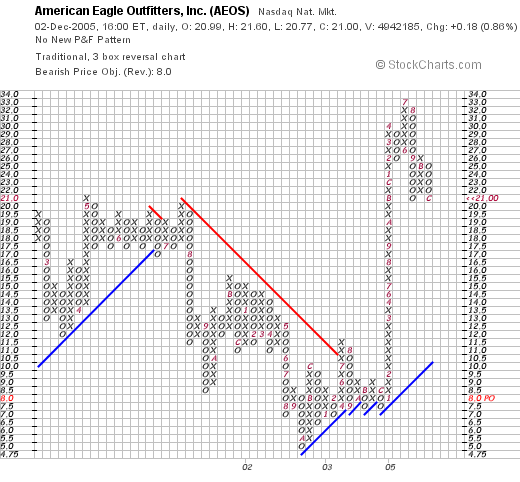 Let's take a look at American Eagle Outfitters (AEOS). I do not own any shares nor do I have any options on this company. 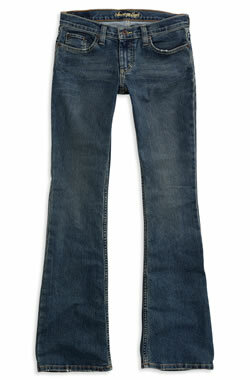 American Eagle Outfitters (AEOS) closed at $21.00 on December 2, 2005, up $.18 or 0.86% on the day. First place to check things out on an investment is the news. Is there something there that you should know about the stock before committing money. Looking through the Yahoo Finance page on AEOS, I came across the November Same-Store Sales report. On November 30, 2005, AEOS reported that sales at stores open at least a year, gained 1.7% which was "far below analyst estimates." Even though total sales climbed 6.9%, much of this was due to new store openings. The company said the results were below management's expectations, and cut its fourth-quarter outlook to earnings between 70 cents and 72 cents per share, from 73 cents to 75 cents per share, including a 2-cent tax charge. Analysts, on average, are expecting the company to earn 74 cents per share. Thus we have a real "double-whammy" to report---same store sales coming under expectations and the company lowering guidance to analysts. No wonder the stock has been retreating! Let's look at the latest quarterly report. On November 15, 2005, AEOS reported 3rd quarter results. Total sales climbed 20.5% to $577.7 million from $479.6 million for the same quarter last year. Comparable store sales were up 13.6% in the quarter. (You can see how dramatic the slow down was for November). Net income was also up nicely at $73.3 million or $.47/diluted share, up nicely from the $57.9 million or $.38/diluted share the prior year. Taking a look at the Morningstar.com "5-Yr Restated" financials on AEOS, the page looks perfect, with steady revenue growth, nice increase in earnings, which did dip from $.60 to $.41/share in 2004, but has increased to $1.77/share in the TTM. The company also pays a small dividend and recently increased it. Free cash flow is positive and growing, and the Balance Sheet is perfect with $950 million in combined cash and other current assets, easily exceeding aht $240.1 million in current liabilities and the smallish $87.6 million in long-term liabilites combined. What about a chart? 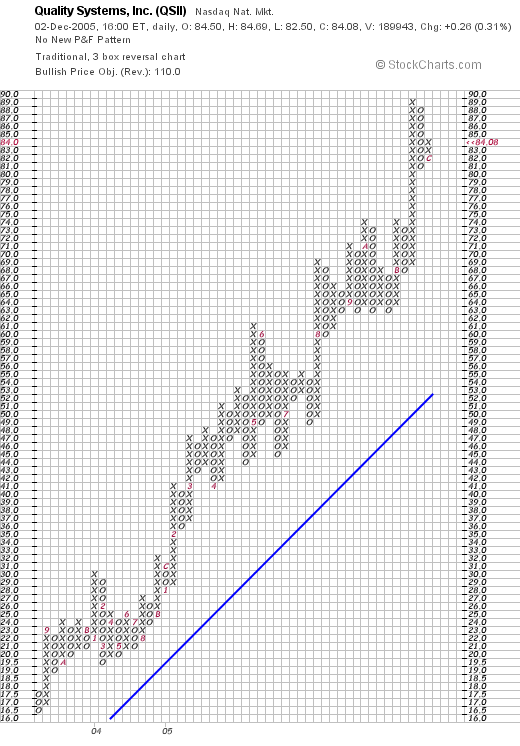 Taking a look at a AEOS "Point & Figure" chart from Stockcharts.com, we can see that the stock has been trading very erratically, increasing from $11.50 in 2001 to $21/share in July, 2001. The stock subsequently sold off, down to $4.75/share in Septeber, 2002, again moved higher, breaking through resistance at $11 in August, 2003. the stock is currently trading at the $20 level, and I don't see support on the chart until way down to around $11. Anyhow, that's an amateur take on this chart :). So what do I think? The latest quarter was solid, the Morningstar.com report was great, and the balance sheet is o.k. What concerns me is the very latest bit of information on same store sales that are anemic, and the company reducing guidance on earnings. This isn't the combination that is likely to lead to a stock price appreciation in the short-term. That, at least, is my take on the matter. Another PODCAST: Could you provide an analysis of some mistakes? Hello Friends! I 'podcasted' the last post MY LATEST PODCAST: A Reader Asks: Could You Share some Mistakes?. Click on the above link to hear my latest podcast! Thanks so much for visiting; if you have any questions or comments, please feel free to leave them on the blog or email me at bobsadviceforstocks@lycos.com. A Reader Writes "Could you provide an analysis of some mistakes?" One of my favorite things on this blog is to get comments and emails from readers. I appreciate the opportunity of joining with you in conversations about investment questions! Well first of all I would like to thank you for being a regular reader. It means a lot to me that some people would find what I write worthwhile and would come back regularly! Let me try to get right to your question. There are two parts (or more) to my blog! First of all, I like to write about investments in general; writing about stocks that may be worth considering for purchase. In addition, I write about stocks I have actually purchased. In both cases, I try to let the reader know about the good news and the bad news. In other words, each week I review stocks I looked at a year earlier. Some of these reviews show losses. Others show large gains. I don't skip any of the stocks that I have picked. If it appears that many of the stocks have performed well since listing, it isn't because I have been leaving off the losers. It is just that what I have been done is working :). And regarding my portfolio. I post all of the transactions in my portfolio in my blog under the heading of "trading transparency". If it seems like I am just mentioning sales on gains, well, in fact, I have mentioned losers, but I have simply been picking stocks for purchase that have done well the past two years. Let me explain. I currently own 20 different positions in my portfolio. Of these stocks, only two are currently showing unrealized losses: Blue Coat Systems (BCSI), a recent purchase, is showing a loss of $(70.15) on my purchase or (.96)%. The other loss is Progress Software (PRGS) which has an unrealized loss of $(13.12) or (.18)%. The other eighteen holdings of mine have gains ranging from 2.9% for SRA (SRX) all the way to an unrealized gain of 442.53% for Quality Systems (QSII). I am very proud of my performance in my trading account, which currently has an unrealized gain totalling $38,000.14. Is this hard to believe? It is for me! But I have posted all of my transactions on this blog for the past two years and if you dig through it, everything is documented. Welll, you might say, I must be selling all of my many losers, so what is the realized gain or loss in the portfolio? As of 12/2/05 at 3:42 a.m., (the date and time on my Fidelity account that I am reading as I write), I have a net realized short-term gain of $6,174.91 in 2005 and a net realized long-term gain of $19,116.57, for a "Total Realized Gain/Loss" of $25,291.48 for 2005. My continued success is why I am not posting much about losses. But I have had some significant losers. I have lost money on Abercrombie & Fitch (ANF), purchasing 160 shares on 6/7/05 for a cost of $10,902.40, and selling the shares on 8/16/05 for $9,847.83, for a loss of $(1,054.57). I lost $(695.25) this year on Alliance Data Systems (ADS), having purchased 2000 on 6/16/05 for $7,820.00, and selling the shares on 10/25/05 for $7,124.75. Other losses this year include a loss of $(621.02) on Ask Jeeves, sold one week after a purchase (! ), $(744.20) on DRS Technologies purchased 12/20/04, and sold 1/3/05 just a little over two weeks later! Other stocks that I lost $1,000 or less on include Giant Industries (GI), Parlux Fragrances (PARL), Perficient, Quicksilver, and Synaptics. However, my gains have consistently overwhelmed my losses! There really isn't much to talk about on the losses. After I purchase a stock, if it drops 8% I sell it. Period. No excuses. Otherwise, if I have sold a portion at a gain once (at about the 30% level) I let the stock drop back to break-even and then sell the remaining shares. If I have sold a stock more than once, perhaps twice with the second sale at 60% appreciation, I allow the stock to retrace to 50% of the highest sale appreciation point....in this example, back down to 30% gain, and then sell all the remaining shares. I hope this explains my portfolio. When I tell you how I am doing, this does involve some trust. I work extremely hard at posting every little move in my stock portfolio. I think you probably could go back to the dates I mentioned and you will see the sales listed. Please let me know if I answered your question. I believe that selling losers in a disciplined fashion in the very most important thing one can do in managing your portfolio, no matter how much you like that stock! Thanks again for visiting! If you have any comments or questions, please feel free to email me at bobsadviceforstocks@lycos.com or just leave your comments on the blog! Another PODCAST: What to do with JOSB? Hello Friends! I just wanted to share with you my latest PODCAST ON JOSB. You can listen on Podomatic.com or search for "Stock Picks" on the Podcast page of iTunes! A few weeks ago, as part of my portfolio review, I discussed Jos. A Bank Clothiers (JOSB) on Stock Picks Bob's Advice. At that time, JOSB was trading at $46.21/share. I currently own 180 shares of JOSB which closed at $43.06, down $(6.95) or (13.90)% on the day. I originally purchased 240 shares with a cost basis of $31.90 on 4/4/05. I sold 1/4 of my position (I am now planning to reduce this to only 1/6 of a remaining position) when the stock had appreciated 30%. Thus I have 180 shares remaining. This morning, prior to opening, JOSB announced November sales results. Total sales for the month increased 16.1% to $41.9 million, compared with $36.1 million in November, 2004. Comparable store sales were a bit anemic (relatively) at 3.8%; however, combined catalog and internet sales grew 24.3% in the month compared to the same month last year. The stock responded with a sharp drop today closing at $43.06, down $(6.95) or (13.90)% on the day. Compounding this was the downgrade by Ryan, Beck & Co. to "Market Perform" from "Outperform" . The analyst felt that with the weak performance in November, December comps would be difficult especially with last year's 16.2% comparable store sales growth. This month's sales figures compares poorly with October sales results for JOSB which were more upbeat showing total sales growth of 28.5% with comparable store sales increasing 16.2% and combined catalog and internet sales increasing 19.5% over the prior year period. So how does my "strategy" deal with this 'mini-meltdown'? 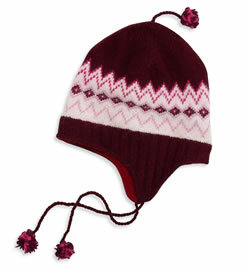 Recall that my 180 shares were purchased 4/4/05 with a cost basis of $31.90. With JOSB closing at $43.06, that still finds me with a gain of $11.26 or 35.3%. I sold my first batch of JOSB, 60 shares representing 1/4 of my 240 share position, on 6/7/05 with a proceeds/share of $41.62 representing a gain of $9.72 or 30.5%. Since I have sold one portion of my position at a 30% gain, my planned sale of the remaining shares would be at break-even on the downside, or a 1/6 (!) position sale if the stock appreciates to a 60% gain level or at $51.04. Does the news represent something really significant or is this a bit overblown? I always reserve the right to unload shares of stock if something bad on a fundamental basis has occurred in any or all of my stocks. But is this result really fundamentally terrible? Recall that sales actually grew, not shrank, and that same store sales which are down from their torrid pace, are still showing positive growth with a 3.8% same store sales figure. In addition, the increase in catalog and internet sales of 24.3% was actually higher than the prior month's results. In my mind, the stock decline was overdone, but I shall respond to the market, depending on how the stock actually performs. 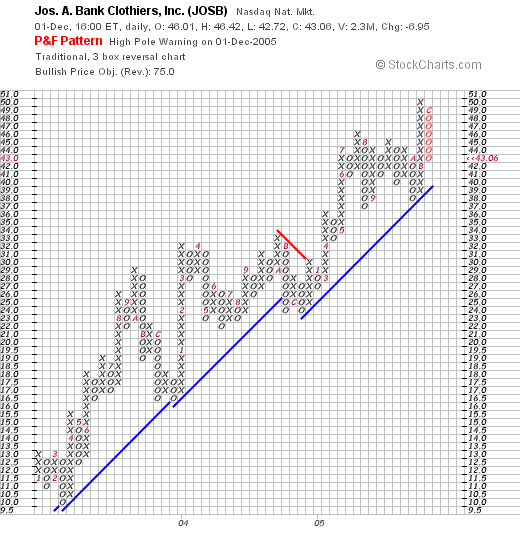 We can see that at least through today's closing trades, JOSB has preserved its strong upward-biased stock chart. The retracement today, keeps the stock above the support level, and I don't at this time anticipate the stock actually breaking down in price! Thanks so much for stopping by! Each of us must decide how we are going to trade our stocks and investments. As for me, I shall listen to the stock market and let the market decide when I need to be in and out of the market! If you have any questions or comments, please feel free to email me at bobsadviceforstocks@lycos.com or just leave them right on the blog. Hello Friends! Thanks so much for stopping by and visiting my blog, Stock Picks Bob's Advice. As always, please remember that I am an amateur investor, so please remember to consult with your professional investment advisors prior to making any investment decisions. A few moments ago, I posted my PODCAST on RPC (RES) on PODOMATIC.com. Please come and visit. You may need to register at this free site, PODOMATIC, to listen to my PODCAST, or you can find me on iTunes, searching for "Stock Picks" under the PODCAST section. Looking through the list of top % gainers on the NYSE today, I came across RPC (RES), which closed at $33.20, up $1.18 or 3.69% on the day. I do not own any shares of this company nor do I own any options. I first posted RPC on Stock Picks Bob's Advice on November 26, 2004, when it was trading at $27.07. RPC had a 3:2 split on March 11, 2005, making my effective "pick price" actually 2/3 x $27.07 = $18.05. With RPC closing at $33.20 today, this represents a gain of $15.15 or 83.9% since posting! "...together with its subsidiaries, provides a range of specialized oilfield services and equipment primarily to independent and major oilfield companies. 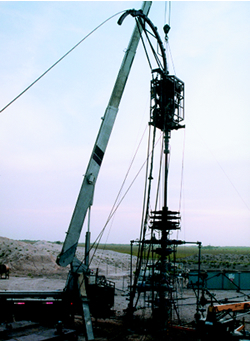 Its serviced are offered to companies engaged in the exploration, production, and development of oil and gas properties throughout the United States, including the Gulf of Mexico, mid-continent, southwest, and Rocky Mountain regions, as well as in selected international markets." Looking at Yahoo "News" on RES, we can see that the company recently experienced an analyst downgrade with ADVEST downgrading the stock from "Strong Buy" to "Neutral". This is after last month's upgrade from "Buy" to "Strong Buy" from the same firm! Looking longer-term at the "5-Yr Restated" financials on RPC, we can see that revenue has been a bit erratic with $202 million reported in 2000, $284.5 million in 2001, then $209 million in 2002. However, since 2002, revenue has steadily increased to $395.7 million in the trailing twelve months (TTM). Earnings have also been erratic, dropping from $.71/share in 2000 to a low of $(.13)/share in 2002, but increasing strongly since to $1.29/share in the TTM. Free cash flow has remained positive but has been impacted by growing capital spending with $5 million reported in 2002 and $3 million reported in the TTM. Looking at the Balance Sheet as reported by Morningstar.com, we can see that the combined $21.6 million in cash and $117.8 million in other current assets is more than enough to pay off both the $61.3 million in current liabilities and the $27.6 million in long-term liabilities. Reviewing Yahoo "Key Statistics" on RES, we find that the company is a mid cap stock with a market capitalization of $1.42 billion. The trailing p/e is moderate at 25.90 and the forward p/e (fye 31-Dec-06) is even nicer at 17.29. Still, the PEG is reported at 2.08, a bit richer a number than I prefer to see. The Price/Sales was reported at 3.47. Yahoo shows that RES has 42.91 million shares outstanding with 514,240 shares out short representing 2.2% of the float or 2.4 trading days fo volume. The company pays a dividend of $.16/share yielding 0.50%. As noted above, the company last split its stock in March, 2005, with a 3:2 stock split. 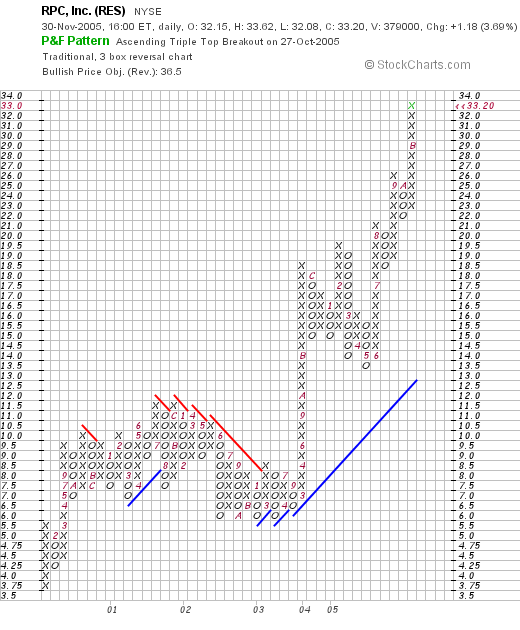 What about a stock chart? Taking a look at the RES "Point & Figure Chart" from Stockcharts.com, we can see that RPC appreciated steadily between January, 2000, when the stock was trading as low as $3.75/share, but went sideways between 2001 and 2003, when the stock finally broke through resistance at $8.50 in January, 2003, ultimately trading as high as $33.20, where the stock closed today. So what do I think? Well, the company sure has done well since I posted it a year ago! The latest quarterly result was quite strong and the second 3:2 split within 12 months for the stock is encouraging. The last several years have seen strong revenue and earnings growth, the cash flow is small but positive, and the chart looks encouraging. This looks like an interesting opportunity to me, but again, I regret that I have not had a sale recently at a gain that would entitle me to purchase anything, anywhere! If you have any comments or questions, please leave them on the blog or email me at bobsadviceforstocks@lyco.com.